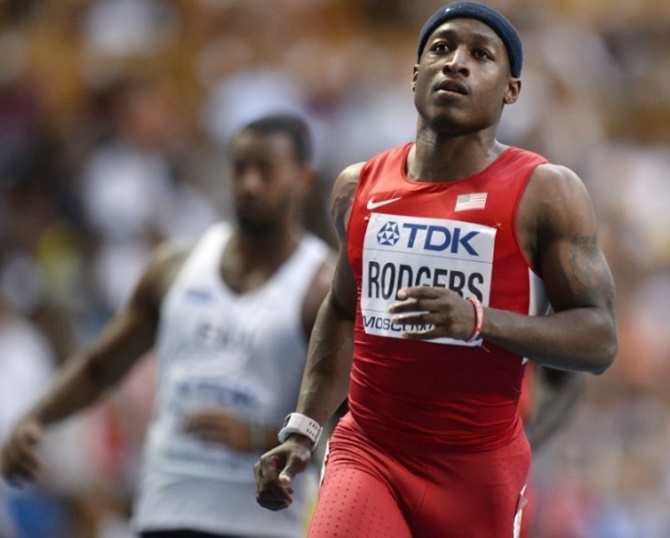 Veteran American sprinter Mike Rodgers cruised to the year's fastest 100 metres when the 33-year-old clocked 9.89 seconds in qualifying at the US championships in Iowa on Thursday. The performance, in what Rodgers said were new shoes, stole the show from America's younger generation of sprinters on the first day of the meeting that will decide the United States team for next month's Athletics World Cup in London. "I felt like I could have run faster," said Rodgers, who has been dogged by injury in recent years and not run that fast since 2015. "I kinda slipped (at the start) because of the wet track but I am fine." Talented 20-year-old Noah Lyles had the second fastest time, 9.92 seconds, but unlike Rodgers, his run was wind-assisted, coming with an aiding wind of 3.4 metres per second. The wind on Rodgers' race was 1.4 mps, under the allowable 2.0 mps. World indoor 60m bronze medallist Ronnie Baker, the pre-meet co-favourite with Lyles, was next in 10.00 seconds as he won the opening preliminary. The previous best time for the year was 9.91 seconds by Britain's Zharnel Hughes. Collegian Ashley Henderson led women's qualifiers, clocking 10.91 seconds with a big tail wind. American record holder Molly Huddle won her fourth consecutive women's 10,000 metres title, running 31:52.32 to defeat Marielle Hall (31:56.68). Olympian Lopez Lomong overtook Shadrack Kipchirchir to win the men's 10,000 in 28:58.38. Three field events also were decided, the most noteworthy being collegiate champion Keturah Orji's third-round triple jump of 14.59 metres to upset U.S. record holder Tori Franklin, who leaped a wind-assisted 14.52 metres on her last attempt. Kara Winger claimed her eighth national javelin title (62.88m) and Valarie Allman won the discus (63.55 metres). The qualifying race was to have been the 18-year-old's professional debut.